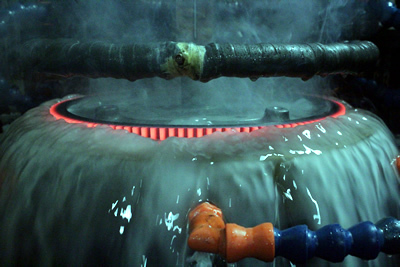 As induction specialists since 1946, Induction Heat Treating (IHT) Corp. specializes in induction hardening for metal parts, specifically allowing for selective hardening of certain zones. When required, the process can leave the core structure of the material soft while the surface of the part is case hardened--a quality and cost-saving benefit in many cases. "Our process is capable of ensuring a better part for the customer because in some cases, you do not want the entire part through-hardened; you only want it hard on the end or only in the middle," said Dave Secrist, production/sales manager. "In some applications, leaving the core structure of the material alone and only changing the properties of the steel at the surface is ideal." Mainly dealing with the hardening of steel, IHT uses an induction heating process that involves rapidly heating specific areas of a steel part, followed by rapidly cooling the heated area. The benefits, according to Secrist, include superior mechanical properties, better control of distortion, and lower manufacturing costs. Energy costs are lowered by the reduction of heat generated and heat extracted. "With induction heating, we keep the distortion down and selectively harden zones so you can do finish turning on other areas later with the soft material," said Secrist. A hard surface and a soft core results in a combination of strength and toughness not attainable with through hardening, he said, adding that the less an area is heated, the less distortion is produced. With furnace heating, which the company does not do, the entire part is heated, meaning it is hardened throughout. This necessitates hard turning the part to its final dimensions, which costs more, takes longer, and is harder on the equipment, Secrist explained. The distortion with furnace heating is higher since the entire part is hardened and becomes more brittle. The Crystal Lake, Ill., company (www.ihtcorp.com) case hardens, meaning the core material stays soft, which helps eliminate brittleness and distortion because the entire part is not taken above 1500 degrees. "We use an inductor that is built specifically for each part's shape, size, and customer specifications. Then we induce an electrical current through the inductor which causes the part to get hot very quickly. We can use CNC controls to hold our pattern and length within thousandths of an inch," Secrist said. Tight tolerances of 0.010 or less can be held. "Our process is capable of ensuring a stronger part for the customer," Secrist added. "In some applications, it is ideal to leave the core structure of the material alone, while only changing the properties of the steel at the surface." Induction power supplies are built in many ways that uniquely apply to the intended results. As the surface area to be hardened increases, so do the power (kilowatt) requirements needed to heat correctly. When specified depth of hardness increases, the power supply frequency (kilohertz) must be lowered. Induction is especially suited to case hardening carbon steel. Carbon steel demands fast and uniform quenching, which is easily done with quenching fixtures that spray temperature-controlled quench onto the heated work piece. Sometimes, the heated work piece is immersed and sprayed for more complete quenching. Other materials can be heated by induction, such as copper, brass, and aluminum, which can be annealed (softened) for extruding or crimping purposes. The company's biggest strength is its quality control, Secrist said, adding that a customer's parts are checked once every two hours. For some quick jobs, parts are checked every hour to ensure there is no problem with the equipment and that parts are consistent in quality. "Record retention and traceability are instantly accessible. Jobs that are two months or two years old can be easily repeated. We can pull any order that we have processed and look at our quality checks, draw temperatures, as well as the tooling used for the order," Secrist said. The company uses two main software programs, Visual Shop and ION Simple Trak. Visual Shop stores all of the company's data testing results and setup information. It allows repeatability from one job to the next, so even a job that's two months or two years old can be repeated. "We can pull any order that we have processed--even years ago--and look at our quality checks, draw temperatures, as well as the tooling used for the order," Secrist said. With ION Simple Trak, all of the company's PM and equipment calibration is stored and allows organization for requalification before certifications expire. "Our equipment down time is logged and nonconforming parts get logged. The system makes you look at these items and take action against them. Our nonconforming parts per million is under 0.003 percent for this year," he added. The company is ISO 2001 and CQI-9 certified. A vigorous training program developed with the Metal Training Institute (MTI) helps them teach metallurgic and heat-treat practices. "We combine our custom programs with their (MTI) courses on different materials and types of hardening to create a heat-treat company that has the knowledge to help any customer or engineer who has a process that is just not quite working. In a short time, we can have people speaking the language of heat treating," Secrist said.